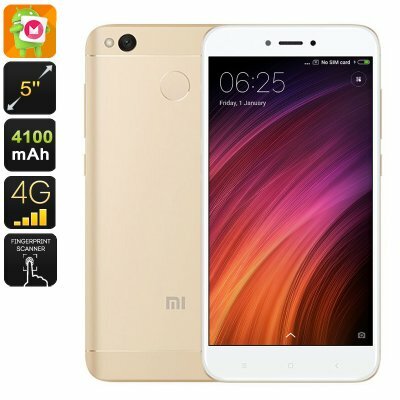 Successfully Added Mobile Phone Xiaomi Redmi 4X - Android 7.0, Fingerprint Scanner, Octa Core CPU, 2GB RAM, 16GB Memory, 4G, 13MP Camera (Gold) to your Shopping Cart. Packing 16GB of internal storage and with micro SD card support for an extra 128GB of space, you'll have plenty of room for movies, games, and apps as well as a wide selection to choose from at the Google play store. Running on Xaiomi's custom MIUI 8V interface, that's based on Android 7.0, you'll find it runs smoothly without any lags and has intuitive features to help navigate between apps and functions. The styling's of this phone is very similar to the Apple handsets. With its slim body, curved edges, and premium build quality this cheap Android phone brings a lot to the table. A built-in 4100mAh battery keeps the phone running for an impressive 15 hours and on standby will be enough for up to 18 days. Dual IMEI number and SIM slots let you use two 4G SIM services at once for the ultimate in network coverage. When it comes to securing your phone the fingerprint sensor makes life quick and easy, no more passwords or codes to remember and only you or those you set up will have access to your phone and its contents. A rear 13MP camera rounds of the features and lets you snap high-quality images and shoot video in full HD. The Xiaomi Redmi Note 4X smartphone comes with 12 months warranty, brought to you by the leader in electronic devices as well as wholesale Android phones and mobiles.. Very fast delivery, great phone, and excellent Customer Support. Would recommend to all!